1. Feel sorry for the people. Often I hear tourists talk about how sad it is for the people of Nicaragua. That they are so poor and must be miserable. If they took off their North American lenses, they’d see the genuine smiles I admire daily on local Nicaraguans. Tourists see laundry drying on a line, a small home, and people sitting out in front of their house at night in plastic chairs and assume that they are unhappy. Don’t mistake cultural differences with happiness. 2. Want to bring one of the poor animals home. Tourists have an urge to adopt. They want to give that poor dog they see on the street a better life. I can tell you, my dog has never been happier than living here in Nicaragua. In the United States, all she did all day was sleep on her pillow-top bed under an attached blanket. The highlight of her day was one trip to the park (if I had time) and dinner. Here, she spends her whole day hunting inside bushes, chasing birds, watching geckos crawl across walls, and following our gardener around the large yard. She gets to go to any beach off leash and most restaurants find no problem with a dog coming inside. Most of the dogs here roam free. They are allowed to dig in trash cans, urinate & dedicate where ever they want, chase people, make doggy-friends, and fornicate when nature calls. I think as Americans we believe that dogs are happiest on top of a nice, overly-stuffed bed with an owner who treats them like a human. I have to disagree. Looking back, I think my dog was bored. She didn’t have anything else to do but sleep and eat. I took her to the park for maybe 30 minutes a day. She was overweight and possibly depressed. Every visitor we’ve had greets us with an air of expedition. This is supposed to be a relaxing vacation and they are in a hurry to go someplace to relax. They want to plan multiple things to see and are nervous that it might not get all done. How can they see fit in relaxing at the beach on the same day as seeing a volcano? They need to swim in the lake at Laguna de Apoyo, but might as well quickly check out Granada while so close. Even my retired parents found themselves frustrated by the pace of Nicaragua. Why does the food take so long at a restaurant? Can’t they open another line at the grocery store? Why are there so many bikers in the way on the road? I find myself relating less and unable to process the nervous energy of my guests. Its like the Tanzanian Devil walking beside you on the beach. A cloud of dust swirling around, unable to land and truly enjoy anything. 4. Assume that everyone speaks English or wants to learn. We made the same mistake when we moved to Nicaragua and were slapped in the face by the fact that many people here neither speak English nor desire to learn it. We have struggled to learn to communicate with the locals. We try daily through much frustration to master Spanish. It is painful to hear tourists passively say that Nicaraguans need to learn English. That is a ludicrous statement and equal to a Mexican in California saying that California’s need to learn Spanish. Would both parties benefit from the ability to speak the other language? Yes. But that does not mean that the person will never be able to meet their full potential if it is not learned. The native language here is Spanish, so do your best to try to communicate in that language. There are many phone applications now that can help you do this with ease. Nicaraguans are very accepting people and with a little bit of effort you will find they have great patience and enjoy the chance to help you learn their native tongue. Charlie on Travel wrote a great article about how not to get robbed in Central America. Let me sum it up for you: don’t wear your most expensive jewelry or go parading around in name brand attire & accessories, don’t keep your whole wad of cash in your wallet for everyone to see when you’re making purchases, don’t get so intoxicated that you loose your wits about you, don’t leave your valuables on the beach/table/bar/community dorm room. If you must carry a phone- especially an iPhone- always be conscious of where you leave it and where you’re using it. If its only to take pictures, then consider using an actual camera. If you wouldn’t do it in Los Angeles, then what makes you think it would be safe to do it in the second poorest country in the Western Hemisphere (*Forbes)? 6. Expect Nicaragua to be just like its neighboring countries. Is the United States just like Mexico? Then why would you think Nicaragua is? I often hear tourists surprised that Nicaragua is so different than their trips to other Central American countries. This is not to say that some days I don’t long for the civil engineering of Anywhere, Mexico, but I did not land here expecting it. Every country has it own attributes. That’s why we travel to different countries, not to see how they are all the same, but to experience something different. 7. Give money to beggars. 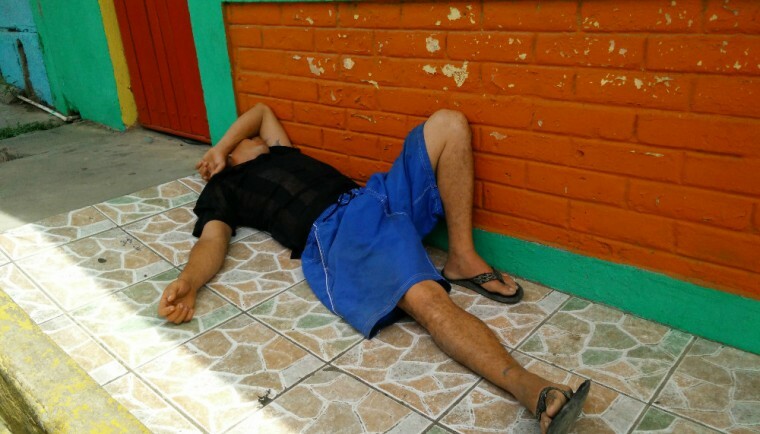 Our little town, San Juan del Sur has a drinking and drug problem. The sweet little kids who sell hammocks are high on glue, the man mumbling to himself and asking for money is drunk and will be passed out in the street in a few hours. These people don’t need your money. If you are in the donating mood, there is an abundance of non profits you could give to and insure your money is going to the right cause.